If you’ve been hanging around at Studio Mothers for a while, you’re already familiar with Kelly Warren. Kelly is an inspiration, living life to the fullest with her twin daughters and husband, a fulltime job, and a busy creative life as a jewelery designer, photographer, collage artist, guitarist, singer, and active blogger. Read the Studio Mothers Breakfast interview with Kelly for details — and a guaranteed smile. As further evidence that Kelly’s creative mojo just can’t be contained, she recently took a big step toward realizing another creative dream and launched a new venture, The Purple Cottage. The Purple Cottage offers unique creative retreats in Jacksonville, FL. The first retreat will take place May 21-23, 2010, featuring the talented Carmen Torbus — who joined us for a memorable Breakfast interview of her own. Carmen is a empowering and inspiring teacher, in addition to being a talented artist. Have a peek at Carmen’s work for yourself. Spend the weekend constructing your personal Dream Book. Explore a mixed assortment of techniques, exercises, prompts and methods to uniquely express your thoughts, emotions and individual artistic style. Cultivate your wildest creative dreams and tuck them neatly into your Dream Book to cherish, reflect upon and nourish your soul. Enjoy a supportive atmosphere where you can give your muse the complete freedom to play and experiment with many techniques. My demos will use paint, papers, photos, ink, collage and other media. I will toss some exercises your way to challenge you to dream bigger and expand your vision. We’ll explore words and text to create personal affirmations and find creative ways to incorporate them in our Dream Books. At this retreat you are free to make a mess, play and let go of the need for perfection. I will gently and playfully encourage you to let loose and fully engage in the moment — creating simply for the joy of the process. Enjoy sheer artful indulgence! Throughout the weekend, we’ll use brushes, pencils, our fingers, stamps, crayons and other tools to create texture and add color to the pages that will fill your Dream Books. We will work on several pages simultaneously, giving you complete freedom to work intuitively. Savor absolute creative abandon! ← Brittany: What Did You Do Today? hahaha! i love your hint at the bottom! Miranda, thanks so much for this plug! 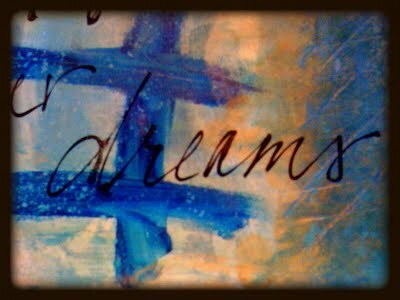 I had on my list today: write a Studio Mothers post about Art and Dreams. 🙂 You beat me to it! Oh this sounds so awesome…. I SO wish I could be there. This sounds amazing! Best of luck to Kelly and Carmen! Can’t wait to hear how it goes.